This INTERMEDIATE pattern is a satisfying project ~ professional in its results, through and through. Large enough to be used every day, yet small enough to be worn comfortably. 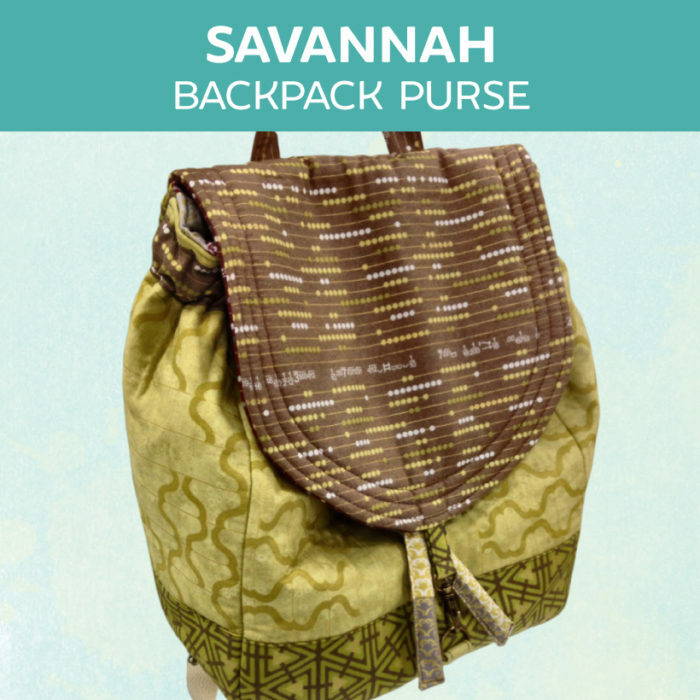 Savannah is as much purse as backpack, with the convenience of being worn over both shoulders or carried by its handle. Two zippered pockets, adjustable shoulder straps, roomy interior. For folks, like myself, that have issues with bag straps slipping off their shoulder ~ you will greatly appreciate the design of Savannah. 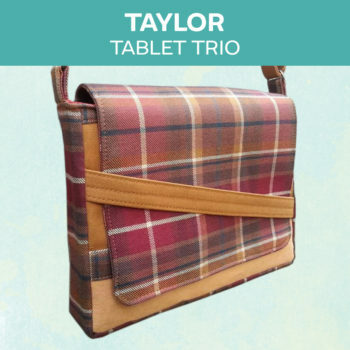 Its sleek design is that of a purse, but is only one swing away from the convenience of a hands free backpack. 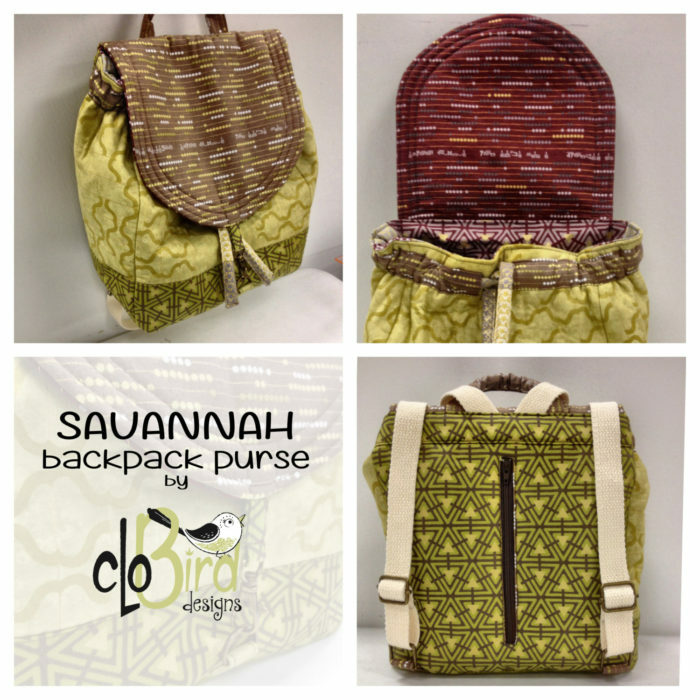 Savannah straps meet in the middle on top. NO sliding straps that are difficult to keep on your shoulders. 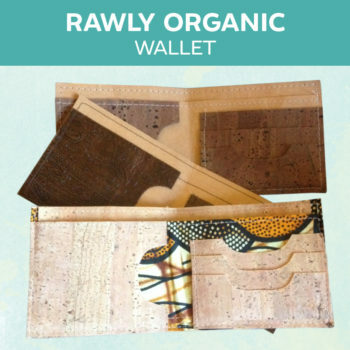 Large zippered inside pocket with easy installation instructions as well as a wonderfully large vertical exterior pocket that is hidden against your back when wearing as a backpack. Perfectly sized “grab and go” handle give it that “purse” function plus adjustable straps for wearing as a backpack so you can go “hands free”. The pattern is fully illustrated, with over 70 color photographs and very detailed instructions, including tips for options. You can also find great fabric, hardware and kits in our shop, The Modern Sewist. Find hardware kits for this pattern here. “Savannah: I give you 5 out of 5 stars! Easy to follow pattern with tons of pictures that leave you with no questions. 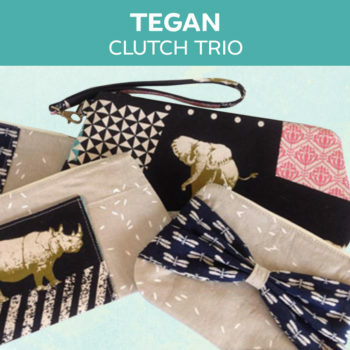 Every detail is covered so that anyone that can follow directions and sew a straight line can make a bag that is not only great looking, but also comfortable and FUNCTIONAL!